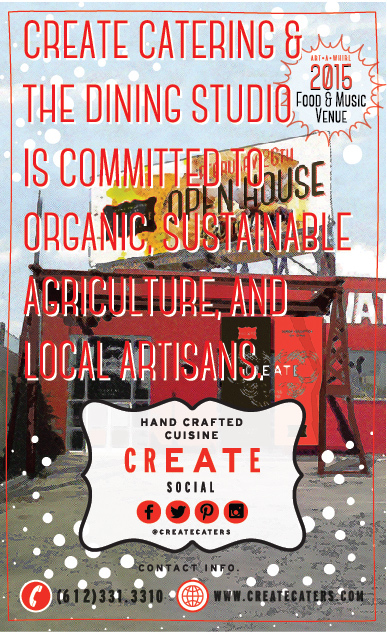 Create is committed to organic, sustainable, agriculture and local artisans. Create Catering is Philip & Desiree Dorwart. We offer fully customized catering and bar services for all types of events throughout Minnesota, working with our clients vision to deliver a truly unique experience. We have over 32 years of fine dining restaurant and catering experience, along with many awards to our credit such as “Best Caterer” (Create Catering), “Best Restaurant” (Table of Contents), “Best Seafood” (Red Fish Blue) and “Restaurateur of the Year” ( Table of Contents). Our service staff is one the the integral parts of making Create Catering the best caterer in Minnesota. Many of our servers and bartenders work at top restaurants in Minneapolis and St. Paul and are fully committed to providing polished and cordial service.